LOFT has a great deal going on now. You can now take an extra 60% off select sale styles. Prices as marked. It’s the end of the season sale for Express and going on now for an unlimited time you can take an additional 40% off already reduced items. I love toothbrush deals, mainly because you should technically change your kids toothbrushes every 3-4 months. So when I can score some great deals, I do – so I can stock up in my bathroom medicine cabinet. 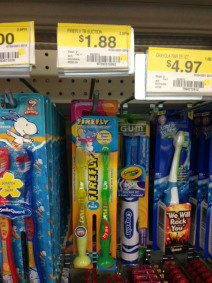 Pay $0.88 or just $0.44 per toothbrush! Right now at Living Social get $10 off your purchase of $25 or more when you redeem promo code FREEDOM at checkout. This code is valid through 7/5/13. Living social is a great way to save money. Many of these deals are national. It also does not matter what city you live in to get local deals. There is always a nice variety of offers available so be sure to check them all out right here. You have a few days before it expires so if you don’t see anything today come back the next few days to see new offers. Time to stock up on your intimates during the Maidenform 4th of July sale. You will save an additional 20% off of all items PLUS get free shipping on your entire purchase (no minimum purchase required). This deal even includes items which are already on sale or on clearance! As you guys know, we’re expecting our 3rd bundle of joy in November, and already looking for deals. We were happy to note that Maidenform also carries Nursing Bras. They’re currently on sale for $32 – $34 down from $40. With the 20% code, these bras come down to $20ish each. We love the support Maidenform gives us for our everyday use so we’ll definitely be trying out their nursing bras. Visit Maidenform for this great sale. Looking for a breast pump? Diapers.com has the Medela Pump In Style Advanced with Metro Bag at 31% off. It’s $239.99 with free shipping. NOTE: As you may know, insurance plans are now required to cover breast pumps. Your policy may be grandfathered in, however, and may thus be exempt from the new rule. Other plans may onlhy cover manual pumps. Want to learn more? Medela offers information and advice about coverage here, and Huffington Post published an interesting article here. Right now you can purchase Barbie Roller Skates For $19.17! Plus, shipping is FREE with Amazon Prime or with Super Saver Shipping on orders of $25 or more! Sears has these priced at $24.19.